This grain-free "rice" is the perfect addition to your next Mexican dinner party or taco night. Healthier and more nutritious than regular white or brown grains, cauliflower rice is also easy to make at home with the help of your food processor. Since cauliflower itself is relatively bland, it's a great blank canvas for the aromatics and seasonings of your choice. In this recipe, garlic, scallions, lime juice and cilantro infuse the vegetable grains with flavor. Serve the rice as a side dish with black beans, or use it as a base for low-carb burrito bowls. Topped with sautéed chicken or pulled pork, avocado, beans and salsa, it's sure to be tastier and better for you than Chipotle. 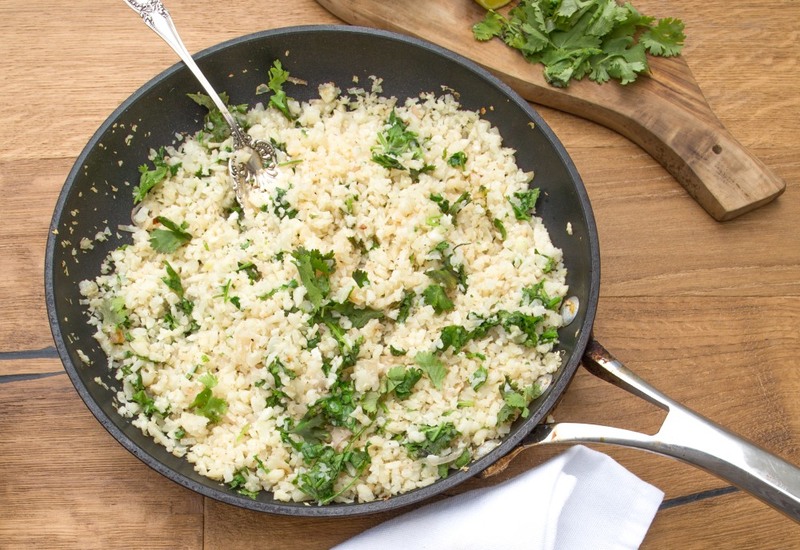 Once you master making cauliflower rice, try out different flavor combinations: use a pinch of saffron, lemon juice and chopped white onion for a Mediterranean version, or use the aromatics in this recipe with the addition of chopped fresh ginger for an Asian-inspired take. Per Serving: 88 calories; 7g fat; 5.6g carbohydrates; 2g protein; 0mg cholesterol; 149mg sodium. Cilantro lime anything is great... And this dish delivered! I topped this dish with a big dollop of Greek yogurt and hot sauce, yum! I wish I liked cauliflower rice more than I do, but I don't. The flavors here are fine, but I simply prefer rice. My wife, however, wants the cauliflower rice for dietary reasons, so we'll continue to make it because she loved it. I'm making a smaller side of rice-rice, though . . .
Been going in an out of the Whole30 diet and this is a staple recipe I go to when I want whip up something quick and easy that will pair well with pretty much any protein I cook. This allows me to get my fix when I want to go out and get a fast food rice bowl, but it's not cheat day. I like to top this "rice" off with some chipotle shrimp or steak slices. Not a huge fan of cauliflower rice in general. I don't know what happens but once it's pulsed down into little pieces, the flavor profile changes. Still, this recipe actually tastes. I just added extra lime, cilantro and salt. Plus garlic!